With the August 9th primary election now just under six weeks away, time is of the essence in getting Wisconsinites the information they need to know in order to vote. 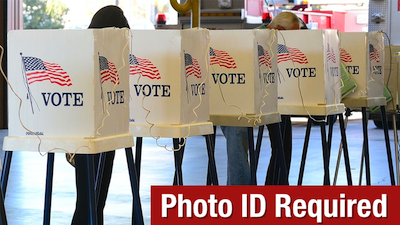 It is important that every citizen who is eligible and would like to cast a vote know what form of ID they need to bring to their polling place (or for in-person absentee voting before election day). It is also vitally important that citizens who do not yet have one of the required forms of ID to vote be informed about what they need and how to obtain it. 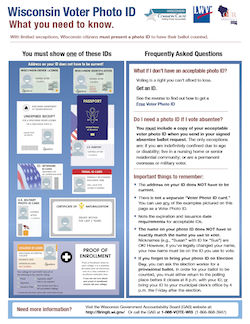 Common Cause in Wisconsin has designed and created a simple, easy-to-understand, two-page general information sheet for all voters about "What you need to know" about Wisconsin Voter Photo ID. You can see it (and download and print it) here. The same information sheet is also available in Spanish language here. We have also developed a similar, simple, two-page information sheet specifically for senior citizen voters, both in English language here, and in Spanish language, here. Finally, we have developed a very simple one-page information sheet: "What College & University Students need to know" about Wisconsin Voter Photo ID as well. You can download it here. 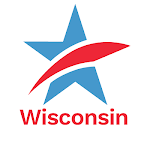 Our friends at the League of Women Voters of Wisconsin and at Wisconsin Voices and many other groups are also utilizing this information to inform Wisconsin voters of all ages about what they need to know in order to get the ID they need for voting and having those votes counted. CC/WI has a limited quantity of printed information sheets (for all voters) available for pick-up in Madison. If you would like to obtain some, please contact Sandra Miller to arrange pick-up. Let's all pitch in and ensure that anyone and everyone who is eligible to vote and wishes to, is able to do so. Getting them the information they need will greatly assist in this critical task. With the passing of the June 1st deadline for candidate filings for state legislative (and congressional) seats in Wisconsin, we now have a clearer picture of how just how incredibly uncompetitive Wisconsin's general elections have become and will be this November. "Congratulations" State Senators-Elect: Darling, Miller, Stroebel, Wirch, Risser and Craig! You have won already! Those six, of the 16 State Senators running for re-election (or in an open seat) this year, are totally unopposed. And of Wisconsin's 99 Assembly seats, more than a third (34) feature incumbents who have no opponent whatsoever in November. There are 17 unopposed Republicans and 17 unopposed Democrats. In an additional six Assembly districts, Republican or Democratic incumbents face only minor party opposition. So in over 40 percent of Wisconsin Assembly elections this Fall, there is essentially no, or very little, opposition to incumbents (or in the case of open seats – to the current political party now holding that seat). Here is the complete listing of candidates for state legislative and congressional districts for both the August Primary and November General Elections. Read it and weep. "Thanks" to the most hyper-partisan gerrymandering of Wisconsin's state legislative districts (in 2011) in our state history – and among the most extreme such partisan map drawing in the history of the nation – Wisconsin voters have far fewer choices than ever before in general elections and the fewest districts on record that can even remotely be considered competitive. The need for fair voter maps and for an end to partisan gerrymandering has never been more compelling. Current CC/WI board member and former Republican State Representative Dave Martin, who represented Neenah-Menasha from 1961 to 1971 and was the GOP candidate for Lieutenant Governor of Wisconsin in 1970, made a compelling case for why Republicans should embrace a non-partisan redistricting process like Iowa has had since 1980 in this opinion-editorial that was published just this past Sunday in the ten Gannett-owned Wisconsin daily newspapers in Appleton, Fond du Lac, Green Bay, Manitowoc, Marshfield, Oshkosh, Sheboygan, Stevens Point, Wausau and in Wisconsin Rapids. 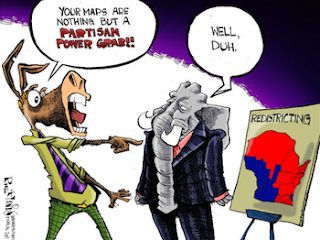 You can help elevate the need for fair voter maps in Wisconsin by signing (only if you have not yet done so) our petition to the Wisconsin Legislature demanding enactment into law of the Iowa redistricting model for Wisconsin in the next legislative session. Our goal is to get 5,000 signatures by December and we have almost 2,000 now, but we need your help in reaching our goal. Wisconsin and Minnesota are case studies in the difference between Republican and Democratic rule. As the Government Accountability Board ends, what's the future for Wisconsin campaign finance regulation?